A market price move in the opposite direction of the main trend is named a retracement. A retracement is also called a correction, which explicitly recognizes that the security had gone too far and is now correcting course, like a ship. A retracement may also be termed a pullback or throwback. If they’ve been buyers, they need to sell. If they’ve been sellers, they need to buy. In an uptrend, a retracement is always a drop in price. In a downtrend, a retracement is always a rise in price. Position squaring generally causes a price move in the opposite direction of the trend. An ordinary retracement caused by normal position squaring can suddenly turn into a full-fledged rout in the opposite direction if fresh news comes out that seems to support a reversal. Sometimes big traders try to trick you into thinking they have interpreted fresh news in a particular way, when all they’re trying to do is push a retracement farther so that they can stampede you into a trading action that is to their benefit. 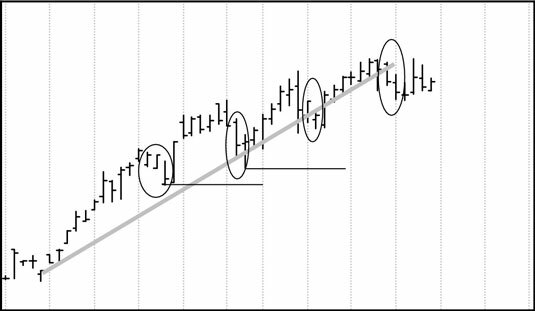 This chart shows a primary trend with several retracements, each outlined by an ellipse. In this instance, the retracements last only a day or two, but retracements can last a lot longer, even several weeks on a daily chart, for example. The press often asserts that every retracement is a profit-taking correction. This assumption isn’t accurate. If traders took profit on every correction, they’d all be rich. Remember, somebody bought at the high. If the correction goes too far against him, he must get out of the position at a loss. To stick to a position when it is correcting against you requires the courage of your convictions — and capital.